Bleed-resistant thread that weathers the elements. PremoBond thread sets itself apart with specially formulated dyes that prevent fading and bleeding. With anti-wicking and mildew-resistant properties, the outdoor thread excels in marine and coastal settings. PremoBond’s bonded, twisted multifilament polyester offers unmatched performance in the commercial sewing industry. Use in industrial applications, like awning canvas, marine vinyl, upholstery, luggage, tarps, slings, or anywhere a heavy-duty thread is needed. 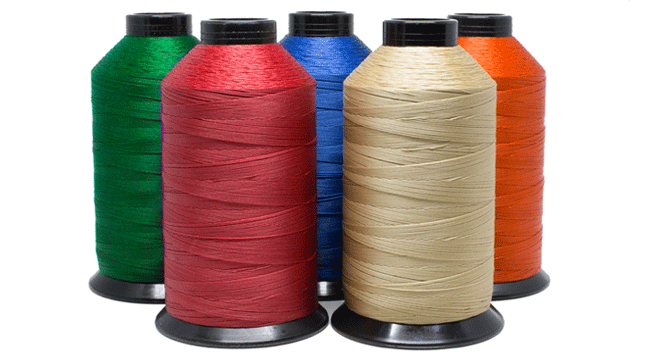 PremoBond is available in thread spools and pre-wound bobbins. Available in 22 different styles, PremoBond thread brings bold color and rugged performance. While one of the best threads for marine upholstery, the UV-resistant thread can be used in a range of outdoor applications. PremoBond bobbins are conveniently pre-wound with PremoBond sewing thread. Choose from 48 different colors and sizes to match any need.